Abraham is enjoying retirement. Of course, retirement as we know it is a modern phenomenon; but still, at seventy-five years of age, Abraham was enjoying the fruits of many years of labor. He was also quite wealthy (Genesis 13:1) and he was living out his later years in the land of his birth. Is it possible for us to imagine how unsettling it must have been to be told to go west to an unknown land while living in retirement in the land of one's birth, and having no personal need to settle anywhere else? Every individual called by God in the Bible is not expecting to be called, and neither is he or she anticipating where God will lead and what will need to be done. The call is always a surprise, whether it is Abraham going to a strange land, or a young man named Saul hiding in order not to be anointed king of Israel, or whether it is another man named Saul centuries later being told on the Damascus Road that he is about to become part of the very people he is persecuting. The call of God is never anticipated. How difficult this is for us to embrace. If we are honest with ourselves, we will admit that we like life to be predictable. We enjoy the routine, and we do not want anything or anyone getting in the way of what we have planned. When the call of God comes into our lives, we discover that the world is not fixed, that at a moment's notice life takes a turn in a different direction. While Abraham's call was no doubt a surprise, it was a call in which God would bless him and his descendants. There would be difficulties to be sure, but in the grand scheme of God’s plan, Abraham would be able to look back on his summons and know that it was a good thing he left his home to travel to the place where God would lead. The call of God reveals that there are indeed wonderful divine possibilities in a world where it is thought to be impossible. Such possibilities offer hope, not only for the one called, but for all those who will be touched by that call. The call of God is never for the individual's sake alone. Abraham's children and grandchildren and great-grandchildren, and so on through the generations all the way through the centuries, would be blessed because of Abraham’s obedience in going west. We must never forget that God always has more in mind than just us. An essential part of Christian character is confident trust in God. 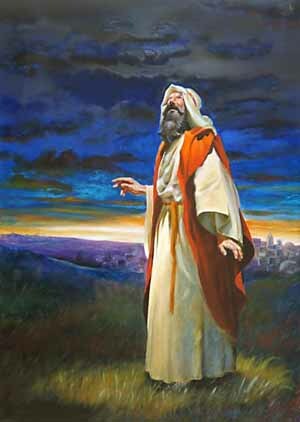 The writer of Genesis twelve indicates that Abraham receives the call and responds in obedience. There is no evidence of a conversation between the two where Abraham attempts to get out of what he is now being told to do. He hears the call and answers it. Abraham steps out in faith, not knowing where this new journey will take him and what will actually happen along the way. Nevertheless, he has come to trust in the God who leads, and so he confidently sets out in faith from the land of his birth. This is why St. Paul can say to the Romans, "Abraham believed God and it was credited to him as righteousness" (Romans 4:3). I am not suggesting that it is wrong to raise questions concerning what it is that God desires of us. Moses does this on the mountain as he stands in the presence of God in the burning bush. What I am saying is that spiritual maturity is revealed in our unwavering willingness to follow where God leads, even though we do not know where the journey will ultimately take us, even though we cannot see the end of the path we trod, and even though the details of the future are out of our grasp. God may call some to travel to places unknown, but God will call others to the journey of faith right at home. The point is not where God will or will not lead; the issue is not what the particulars are of God's will for us. The matter is our obedience to the call no matter where it is or what it is or why it is. Yet, the call of God is not as much an order to obey, but a personal invitation from God to participate in the plans of God to transform, to remake the world. There are sacrifices to be made in answering the call of God, to be sure, but when one considers what is gained as a result of being faithful, what we give up cannot come close to what we receive in the way of blessings. God calls Abraham to sacrifice, but in the process God plans to bless Abraham in ways he could not possibly imagine before his journey with God; and in so blessing Abraham, God has blessed us as Abraham’s spiritual children.